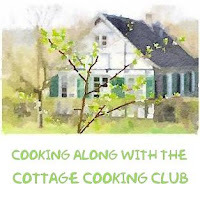 It's time once again for our group; "The Cottage Cooking Club", a group of international blogger's to post our thoughts and experiences on the recipes for the month of February. Together we prepare seasonal and creative veggie dishes from Hugh Fearnley-Whittingstall's cookbook, "River Cottage Veg". Our group is meant to be a project aimed at incorporating more vegetable dishes in our everyday cooking, and is and has been inspired by our dedicated leader Andrea of The Kitchen Lioness. Each month Andrea picks one recipe from each of the 10 chapters and then we pick and choose as many as we have time for. Our motto for the month of February is: Love your late winter veggies! The first recipe I prepared was the mushroom ragout with soft polenta. This was easy to put together and a big hit at my house. The mushrooms melded perfectly with the creamy polenta and was indeed comfort food at its finest. I used baby portabellas but any mix of mushrooms would work very nice here. Hugh recommended cutting the leftover polenta into cubes and frying them, which I did the next day for breakfast and served topped with a fried egg. Delicious once again. For the second recipe I prepared the white bean salad with tomatoes and red onion on top of a bed of romaine lettuce. Here everything was added together and then drizzled with a lemony mustardy vinaigrette that was offset by a pinch of sugar. I served this along-side grilled flank steak and it was a wonderful accompaniment. I can see this being a summer salad staple. Now onto the last dish which was the Sweet potato and peanut gratin. The surprise ingredient was the crunchy peanut butter and lime zest and juice. The saltiness of the peanut butter worked magically with the sweetness of the potatoes and the lime juice added a fresh zing to the flavor. Dried chili flakes, fresh garlic and cream were added to the mix and then baked almost an hour. I finished this dish under the broiled just to get the top a little more browned and crisp. Another home run in my book. These recipes have been slightly adapted from the "River Cottage Veg", by Hugh Fearnley-Whittingstall. First recipe; from the chapter "Comfort Food and Feast” Mushroom ragout with soft polenta (page 57). Second dish from the chapter "Bready Things" White bean salad with tomatoes and red onion (page 240). Third recipe; from the chapter “Comfort Food and Feast” Sweet potato and peanut gratin (page 63). To see what recipes the other members chose for this month, head over to the LYL post for February 2016 on the CCC website, by clicking here. They all look great Cheri - especially love the mushrooms and polenta. Great tip on the leftovers! Have a wonderful weekend. Hi Tricia, the mushrooms and polenta dish was my favorite. Take care! Wow Cheri. You're amazing. Where do you find the time? I suppose it's always easy to find the time to do what we love and I certainly know you love to cook! Well done. These dishes all look amazing. The Sweet Potato Gratin looks especially intriguing and I can't wait to try it. Your mushroom polenta meal looks very gourmet; the bean salad identical to high-end delis...And the sweet potato, pb, lime combo is completely intriguing...I appreciate how the salt and the sweet balance may be completely sublime! Hi Kim, all three dishes were wonderful and special in there own way. Really love the veggie combinations that Hugh comes up with. Oh my, the mushroom polenta is calling my name! What a wonderful cookbook it must be. Hi Susan, yes we only have 2 more months left, doesn't seem like much after 2 years. All lovely meals, the muschrrom and polenta is real comfort food. Hi Suzanne, the mushroom and polenta dish was my favorite, will be making all 3 again. Thanks Liz, that happened to be my favorite out of the three, though they were all delicious in there own way. A great selection, Cheri! I want to try them all. Thanks Amalia, they are all quite different. Hi Tandy, yes I can't beleive it either, it's going too fast. Peanut butter and sweet potatoes are a match made in heaven. Great choices! I'm probably going to be making the polenta tomorrow, because everyone's photos are making me sorry I skipped it. I made the tomato and white bean salad, too - what a treat it was. I bet it will be even better with high summer tomatoes. I'm curious about the sweet potatoes, but the flavour combination is too scary for my partner - I'll have to find a time to make it when I'm eating on my own. Hi Teresa, my husband was not a big fan of the peanut butter and sweet potato combo but I loved it, hope you find a chance to try it. Hi Emily, the polenta and mushrooms were my favorite, loved the sweet potato and peanut butter gratin. Take care! That polenta and mushroom dish looks really warming and quite delicious! I made the gratin as well and used that exact adjective for the lime: zing! It was good and different, which I always appreciate. Looks like you had a great month! Hi Katie, my husband was not a big fan of the sweet potato dish but I thought it was great. The polenta and mushroom was my favorite. Cheri - I am completely intrigued by the sweet potato and peanut butter gratin! These all look good - we make lots of mushroom ragoûts in our house, so I should see what High does with his! Hi David, the polenta dish was my favorite and the most comforting. I can see many variations in my future. Have a great week! Did everyone make the sweet potato/peanut gratin but me? The flavors didn't seem to work for me which is why I didn't try it. Like we learned about Dorie Greenspan after 4 years of cooking from her book...don't doubt the chef. Hugh really has come up with primarily thumbs up recipes so why did I doubt him? The polenta/mushroom ragout was delicious. I made a half recipe so just polished it off the next day. I plan to cook more with polenta so will try some of the leftovers ideas I'm finding on the Internet. Very nice post, as usual. Hi Mary, the polenta mushroom dish was my favorite and I will probably be making some type of this for some time. My husband was not a fan of the sweet potato, I think that it might of had something to do with the peanut butter I used. Take care! Everything looks wonderful Cheri. The mushroom ragout was one of my favourites but I'm wishing I had made the bean salad - it sounds just perfect with grilled steak. Hi Zosia, the bean salad was great, thats what is so great about cooking as a group, hearing everyone's comments. Mary made the bean salad with artichokes, will try that next time. Take care! Cheri...I made the white bean salad and the sweet potato gratin as well. And I loved them both. Now I'm kicking myself for not trying the polenta & mushrooms. Yours looks so yummy & comforting. Definitely putting that on my must make list! Hi Anne, so glad to meet you, wish I would have tried the toastie after reading through your post, looked amazing. Nice choices, Cheri. No overlap with mine, so I'm glad to hear you loved them all. I'll have to give your choices a try when I get a chance, especially the mushrooms and polenta. Have a great week. Hi Betsy, the mushroom and polenta dish was my favorite, hope you get a chance later. Take care! we love white bean salads in the summer, especially with lots of lemon in it. Thanks Dannii, we loved this salad. I want to dive in that mushroom ragout + polenta dish, it looks so scrumptious. Have a great week Cheri! Thanks Mike, the mushroom ragout was my favorite of the 3. Take care! Everything looks wonderful. Love everything about that white bean salad. Thanks Chris, I think that it will even taste better with summer tomatoes. Whew! That was a scroll down exercise, LOL. Lovely though! Hi Cheri, your dishes look terrific. Love the mushroom ragu on polenta looks and sounds delicious, a wonderful combination. 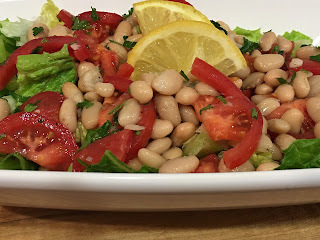 The white bean with tomatoes and red peppers on romaine is also a nice grouping though it makes me smile in similarity to my former twice weekly tailgate salads. I am rather intrigued by the sweet potato and peanut gratin and do plan to prepare this in the future. Nice roundup. See you soon! Thanks Peggy, can't believe there is only 2 months left, it really has been a great experience. Take care! Thanks Vidya, hope you get a chance. Hi Phi, it's a match made in heaven. Some great recipes! Love the sound of that gratin with the peanut butter, not tried anything similar! Hi Caroline, it's almost like a satay kind of taste if that makes sense. It's good. I must try that sweet potato and peanut gratin!! So yum! Thanks Angie, it was really good. I'v often served the mushrooms and polenta or an appetizer for a winter meal. I drizzle a little balsamic syrup over the top and everyone loves it. What great recipes you made this month! Hi Abbe, great idea...will try balsamic next time, one of my favorites for sure. Thanks! I loved it and then I read sweet potatoes and crunchy peanut butter and my brain exploded with desire. Wow! I think that's for me. All of these look wonderful, Cheri! I would love to try them all. That being said, the sweet potato and peanut gratin sounds really interesting. Such unusual ingredients to put together, but I can see how they would work together to make something really special. The mushroom polenta sounds like total comfort food! Thanks Shari, the sweet potato dish was delicious, the flavor was more satay like, very interesting. Huge knows how to do veggies right. 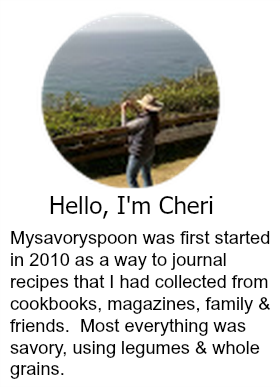 Dear Cheri - thank you for a wonderful post with all your lovely dishes! Since I made those three recipes as well I can attest to the fact that they taste extremely good! You did a marvelous job with your presentaions and you are making me very happy since you and your hubby enjoyed your dishes so much! Thank you for your continued support of the Cottage Cooking Club! Thanks Andrea,I really enjoyed the dishes this month. Cannot beleive we only have 2 months left, it's been a wonderful experience. These dishes all look so good! I absolutely love polenta and I just know that white bean salad will be perfect to make in the summertime Yum! Your dishes look delicious!! I made two of them, but I have to say, that salad looks very, very inviting! I liked everything I made as well - great month!!! Thanks Candy, it was another great month, have not started on this months recipes yet.